Investors’ need for income has never been greater, given the economic backdrop of low interest rates and low bond yields, so the challenge for advisers to source this income is considerable. Recognising the available options and understanding how to meet this challenge is now crucial. Moreover, many investors do not fully understand the risks associated with generating a steady income stream to meet their needs in the current environment. Advisers need to recognise the wider range of options available and learn how best to use them for the benefit of their clients. The experienced members of this panel will debate the issues that surround meeting the needs of income-hungry investors, paying particular attention to the possible pitfalls of relying solely on income from the UK market and examining the growing range of opportunities that now arise overseas. They will look at the impact of the increased concentration of income from a shrinking range of companies and sectors in the UK –a development that has challenged many equity income managers - and discuss the merits and potential risks of diversifying income sources outside the UK. As the ISA season approaches, they will look at ways to maximise income, with a spotlight on closed-end funds in a tax-efficient wrapper. 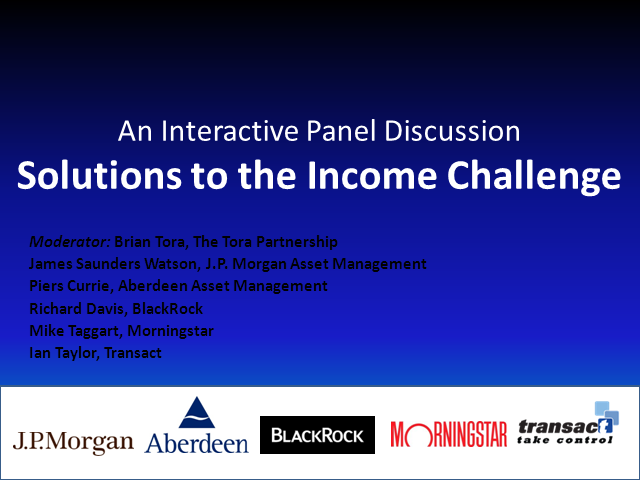 The panel will talk through the benefits of revenue reserves, a feature unique to CEFs, and share their thoughts on how to best serve the income-seeking clients of advisers.